Baroness Warsi, the first Minister for Faith is certainly keeping herself busy at the moment and ruffling plenty of feathers in the process. In the last week she has given a speech at the University of Cambridge calling for faith, and Christianity in particular, to be right at the heart of British politics. Her reminder that Churchill and Thatcher both believed that effective politics should be inspired by the Christian faith along with a passionate call to ensure that religion is given a voice at the top table didn’t go down well in some quarters. Terry Sanderson, President of the National Secular Society, wrote an angry response describing her role as the very antithesis of secularism. The reason for her trip though was to raise the issue of the persecution of Christians around the world. In an ardent speech at Georgetown University, Washington she warned that Christians in some parts of the world face a desperate future because of violence against them. Prior to the speech, she spoke to BBC Radio 4’s Today programme setting out much of its content:. “I’m concerned the birthplace of Christianity, the parts of the world where Christianity first spread, is now seeing large sections of the Christian community leaving and those that are remaining feeling persecuted. “One in ten Christians live in a minority situation and large numbers of those who live in a minority situation around the world are persecuted. Tragically, what’s happening is that they are being seen as newcomers, being portrayed as an ‘other’ within that society, even though they have existed there for many, many centuries. “What we are seeing, sadly, is a sense of collective punishment meted out by local groups – sometimes states, sometimes extremists. They are seen as legitimate targets for what they perceive as actions of their co-religionists. This concept of collective punishment, about them being seen as agents of the West or agents of regimes is wrong. For the Baroness, the key is for politicians in countries with a Christian minority to speak out against discrimination. Beyond speaking out, Lady Warsi urged politicians to keep their word by ensuring that their national constitutions are met and that international human rights laws are followed. “There is much more that we can do. There’s an international consensus, in the form of a Human Rights Council resolution on the treatment of minorities and tolerance towards other faiths. But we need to build political will behind that. “I do not buy the argument that faiths are on a violent collision course, that division and sectarianism are inevitable. Yes, the battle lines have been drawn on religious divisions in the past. People are exploiting them today, finding a convenient ‘other’ – a scapegoat – in their minorities. But history shows this is not inevitable; communities can and do co-exist. “There are real challenges for Christians in this part of the world to support and get alongside them and also for politicians to understand that the presence of Christians is a great mediating factor, often for example between different segments of Islam. 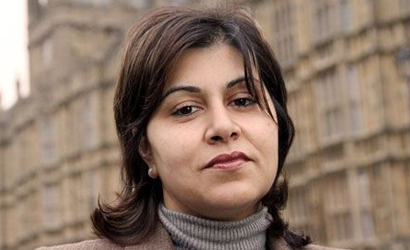 Lady Warsi is the first senior British politician to draw significant attention to the suffering of Christians in the Arab world. She may be a Muslim, but she fundamentally understands both the contribution of the Christian faith to British politics and the plight of Christians around the world. More importantly she knows that with the situation many persecuted believers face around the globe, words of sympathy are not enough; the time for coordinated political action on their behalf is long overdue. What did the Foreign Office do to tackle religious persecution in 2012? Great blog Edward. Had previously read something about this a week ago in the UK electronic press, WE SHOULD ALL WRITE TO THANK BARONESS WARSI! Wonderful from a Muslim … can we hear more from our Lib Dem leadership – and strive for a cross-party approach to a neglected issue of international justice and freedom? Quite right. This really shouldn’t be a party political issue. It would do a lot of good if the different parties were willing to publicly support what Baroness Warsi has spoken about. It’s not just about Christians; it’s about the defence of human rights and publicly speaking out against violence and abuse aimed towards those who have done nothing wrong too.